Laravel framework became a number one framework in php development it has lot of advantages. Easy to run with homestead. Apart from the above features Laravel comes up with Eloquent ORM Powerful Database component, it is used to handle all database related operations. If you already using laravel framework with your project then it’s good you can skip this post, but if you have a existing application, which is already in development phase and you won’t be able to convert it to laravel because of time limitations and still you wish to use Eloquent ORM for your future task from the project then this post is going to help you to install eloquent and use. Before following this tutorial you needs to have composer installed on your system which is going to help to pull in eloquent package. Create project directory called demo, if you are installing in existing application then just cd in to you project directory with the terminal. It will create composer.json file (if not exist) in your root directory with require dependancy, it is going to create vendor folder with the required files and folders in it, don’t worry about it for now. Make sure you get above message. if you open composer.json file it would look like this, version number may change according to the availability. Setting up the autoload is important to have our namespace working, we are going to use here classmap, you can also you psr-4 which is also good option. You might thinking, what we are doing by adding autoload and classmap to the json file? We basically referencing the Model directory to autoload, after adding those lines use following command to dump and autoload your composer. Eloquent ORM currently supports MySQL, Postgres, SQL Server, and SQLite, we can easily setup connection with any of those, I am going to use MySQL here for the demo. 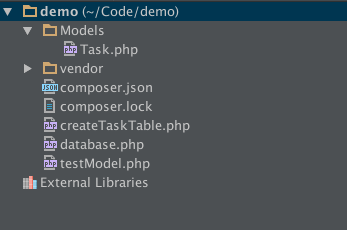 Let’s create our first Eloquent Model, create new directory called Models, here we will store our ORM models. We can use all available options ‘$table’, ‘$primaryKey’ or mass assignment array called $fillable and many more. Before going to use this model, we need database table, to do than we will use Capsule::schema(). It should show success message. If you see new record is created and listed that means your good to go and use Laravel Eloquent ORM in your project. Tnanks for lesson! How can i use Capsule ORM with cache (memcached)?